Last year’s coach of the side Derek Perera is confidently supporting the side to make an impression on this occasion and assuring the North American fans that the boys are capable enough to do the trick. 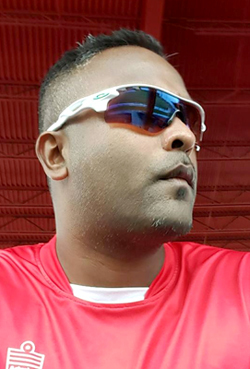 In an exclusive interview with USACricketers.com, Perera, the former Canadian International player stated that the team is balanced and that would definitely evoke a sense of triumph by the conclusion of the annual limited-over tournament. “I certainly think that the team will do well this year. In fact I’m glad that the squad is pretty much the same with the inclusion of a couple of new players, namely Nikhil Dutta. The team will have the benefit of having played in the last tournament and know each other and the competition a lot better,” Perera related. Quizzed on some the challenges the Americas will face, Perera stated that because of lack of adequate outdoor preparations might be the hugest one. “The fact that for many of the players, they’ll be “coming out of the cold” having played indoor for the last few months, doesn’t really help. However, I know some players have been training in warmer climates overseas preparing so they should be fine; as far as the opposition goes, they have the benefit of playing together very closely so they will naturally have a strong team dynamic and understanding,” Perera, who only appeared in a solitary game for Canada, revealed. USA coach Pubudu Dassanayake will be in charge for this year’s assignment. He will be assisted by former Canada fast bowler and current Cricket Canada selector Henry Osinde. The side is made up of players from USA, Canada and Bermuda. ICC Americas will open their campaign is against Combined Campuses and Colleges Marooners on January 26. They are joined in the five-team Group B with Guyana Jaguars, Jamaica Scorpions and Barbados Pride. Group A consists of Trinidad & Tobago, Windward Islands Volcanoes, Leeward Islands Hurricanes, West Indies U-19s and English County side Kent. Perera also spoke enthusiastically about the experience and exposure in 2016 which could be very beneficial now. “It was a rewarding experience, being the first time I’ve been named Head Coach in a tournament of that stature and working with a great set of players and coaching staff. I think that it being the first time that we competed as a combined team in this tournament, it was a bit of a challenge to nail down roles in such a short time, but we finished strong and that’s important. It’s important for our cricket development that we are consistently involved in competitions like this at all ages,” the all-rounder commented. The side will lead by talented Canadian all-rounder Nitish Kumar. Kumar led Canada to the championship in the Auty Cup last year and Perera is strongly backing his compatriot to be a good skipper on historical tour of this magnitude. “I strongly back Nitish as captain; he has a great cricketing mind, one of the most experienced players despite his young age and most of all respected by the team. I know he would do a great job,” Perera reasoned.